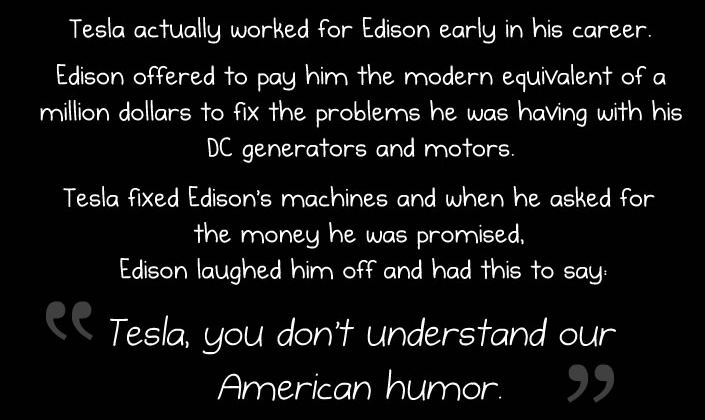 Did Edison refuse to pay Tesla, saying “You don't understand our American humor”? The Wikipedia citations cannot easily be checked (since they are all in hard copy books). However, I managed to access one of the citations (Tesla: Man Out of Time) via its Google Books preview. It also makes a far weaker version of the claim, since it also quotes Edison's supporters denying that he had made that statement, instead saying that the payment was in exchange for purchasing one of Tesla's patents. The citation given (Citation 10) was inaccessible through the Google Books preview. This unsourced Reddit comment also asserts that he could not find citations that Edison actually scammed Tesla while making that quote. There is no mention of Edison uttering 'you dont understand american humor', or at least I cant find any. It should be important to note that Edison, while being an inventor, ran a business. Most of his actions (that have polarized views right now) as a result, need to take this into account. A later comment in the same thread claims that it was not Edison, but a manager at the company who made that statement. Again, this ascription was never made by Tesla himself in any recorded medium. He names only "The Manager," whom people took to be Edison. But Edison wasn't the manager; as I point out every time this comes up, Samuel Insull was in fact though Charles Batchelor had the title. Insull really, really disliked Tesla, and such a thing was within his personality; Edison expressed no such animus. Did Edison refuse to pay Tesla, and did he make that statement (or any other similar comments)? The source of the quote is John J. O'Neill's Prodigal Genius: The Life of Nikola Tesla (1944). The story essentially claims what The Oatmeal says: that Tesla went so far as to see machines built with his improved parts before Edison denied him his money. There, I am afraid, the trail ends. O'Neill was a Pulitzer Prize-winning journalist, but he did not explain where he heard this particular quote. For nearly a year my regular hours were from 10:30 a.m. until 5:00 a.m. the next morning without a day's exception. Edison said to me, "I have had many hard-working assistants but you take the cake." During this period I designed twenty-four different types of standard machines with short cores and of uniform pattern which replaced the old ones. The Manager had promised me $50,000 on the completion of this task but it turned out to be a practical joke. This gave me a painful shock and I resigned my position. So this boils down to precisely what Reddit says it does. It's Tesla's word against the word of Edison's supporters, and O'Neill's biography is responsible for making Edison himself the villain. 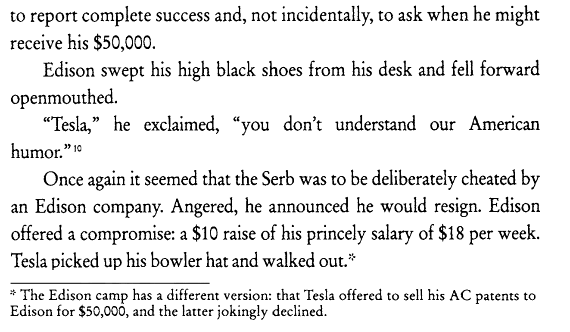 We can no longer know today what actually happened between Tesla and "the manager" or who "the manager" really was. I think it is plausible to say that O'Neill took Tesla's story and misread it in a way beneficial to imagining Tesla and Edison as direct rivals. Samuel Insull is a likely better candidate for the manager. Not the answer you're looking for? Browse other questions tagged quotes thomas-edison .